Dry needling is an effective treatment for chronic pain of neuropathic origin with very few side effects. The needles target trigger zones in tight muscles to release tension and reduce pain. The needle used is very thin and most people do not even feel it penetrate the skin. 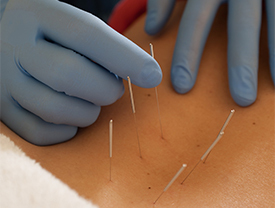 The techniques of Dry Needling are effective working to treat different conditions caused by tendonitis and chronic joint and back pain or tension headaches.